The income first-time buyers need to get on the housing ladder has reached unprecedented levels, a report says. Research for the housing data company Hometrack shows the ratio of house price to income has nearly doubled in the past decade. An average house in Britain now costs more than five times the average first-time buyer's income. The average cost of a home in England and Wales is £176,300, according to Hometrack's figures. This ratio of house price to income is far higher than at the peak of the last price boom in 1990. Despite a long period of low interest rates, mortgage costs as a percentage of income - seen by some as a fairer measure of affordability - have also virtually doubled over the same period to more than 32%. Figures show the most expensive place to buy is the London borough of Kensington and Chelsea, and the cheapest is the district of Wansbeck in Northumberland. 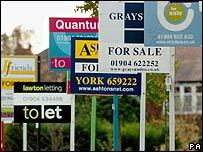 The BBC's John Andrew said the research also shows how private renting is on the up, helped by the boom in buy-to-let. Across England, the cost of renting was generally up to 30% cheaper than a mortgage on the same property. The report also found that nearly half of all households on the move were going into the private rented sector, which is now enjoying increased investment after a century of decline.